iPhone wall socket charger that allows you to mount your iPhone into a wall socket in such a way that it stands up. Neat idea really if you want to check the charge of the battery via the display at a glance rather than picking up your iPhone. Works on United States wall sockets. 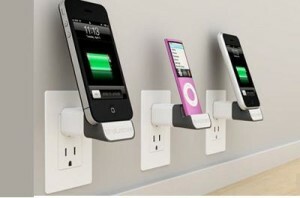 It charges iPhones and iPods. 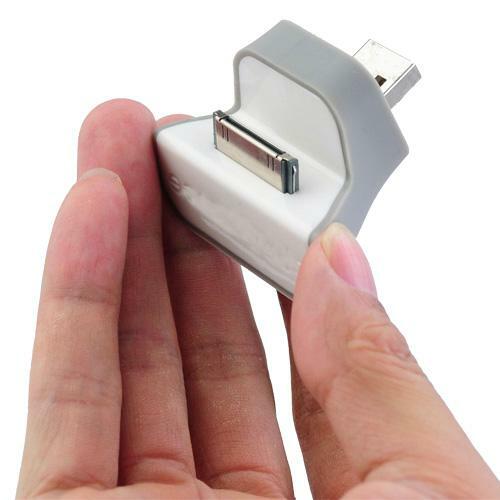 There is a typical charger dock for apple’s iPhone and iPod that this fits into. Holds iPhone upright so you can see messages such as missed calls. The main positive of the device is that it does not have any wires sticking out and around, which typically get in the way. It is a very neat item that will keep your house just that little bit tidier. It also keeps your iPhone or iPod free of the ground where it can be stepped on, so in a way protects it. The next positive is that when you plug in your iPhone it is propped up in just such a way as to display the charge. This way you can see from a distance just how far charged your phone is. For people in a rush and waiting for their phone to charge this can be invaluable. It is also useful as if you come in after a missed call you will be able to see the display. There is not really a major negative with the item and it really does what you would expect it to. If there was one problem with it perhaps the lack of side rails of some kind to hold the phone in snugly might be an issue. For the most part the port itself does a good enough job of this and the groove in which it is inserted holds it fairly snugly to begin with. The interesting thing about this item is that it has no reviews on Amazon yet, which I believe is the consequence of them not stating clearly which type of wall socket it plugs into. The short version is that this is a simple product that basically does what you would expect it to.